The humble egg packs a pretty powerful punch on the nutrition scale. Both the white and yolk of an egg are rich in a number of nutrients, protein, vitamins and minerals. Eggs make for a versatile product in the kitchen and are often the glue of many baking recipes. Whether you have a love of omelettes or make a mean Victoria sponge, home grown eggs have a place on the table. Many people have turned to raising chickens or ducks and eating home grown eggs over the store-bought alternative. There’s something very special about being able to walk out into your garden and collect a few fresh eggs for breakfast. Being in control of your own food supply gives you peace of mind. You know exactly how your animals have been treated and the type of nutrition they are receiving. If you’re considering investing in your own flock, here are eight amazing benefits of fresh home grown eggs. Within minutes, home grown eggs can be collected, cooked and put straight on the plate. Visit and greet your chickens every morning, coming away with the freshest of eggs. The convenience, speed and freshness that comes from home grown eggs are huge benefits to raising your own birds and producing eggs. Fresh, home grown eggs are known for having rich and vibrant yolks with clear whites. Specific ingredients are responsible for taste and appearance. Unlike chickens in factory farming conditions, home grown chickens are often fed food sources from a higher quality, therefore, improving the flavour and colour of the eggs. If you can, choose a high-quality complete feed that will impact the taste and quality of your eggs and see the difference. Naturally-raised chickens, unlike caged chickens, are not confined indoors. They’re exposed to the sun and are able to synthesise vitamin D and part of this vitamin D is transferred to the eggs. Natural eggs have around three to six times the vitamin D as regular eggs. The environment in which the animals are raised is essential to their general health and therefore the eggs they produce. Daily exercise and proper nutrition from grains and fresh greens mean they are jam-packed with good foods. Home grown eggs have been found to have twice as much Omega-3 fatty acids, three times more Vitamin E and 50% more folic acid. Nutrient-rich eggs are just one of the fantastic benefits you can get by raising your own animals and producing eggs. If you raise your own chickens, ducks or even geese then you know exactly how they are treated. You can rest assured that your eggs were humanely produced. Chickens are found to be happier and more naturally inclined given the right environment. When they are able to take part in normal chicken activities such as nightly roosting or dust bathing, they are much healthier. When your picking your own eggs another thing you can be certain of is the shelf life. You know exactly when the eggs were collected and how long they have been sat on the kitchen side before cooking them. Supermarket eggs need to be collected, transported and put out onto the shelf before you can even buy them. Therefore, the time between laying and on the plate is much longer. Before you eat your eggs or store your eggs, they need to be cleaned. If you’re not too worried about a little bit of dirt, you can store them straight away unless you’re giving away some excess eggs to friends or family. Freshly laid eggs can be left out at room temperature for at least a month before they need to be moved to the fridge, although the taste is better in the first two weeks. Food safety plays a massive part when it comes to eggs. One of the main worries about eggs is the possibility of salmonella infection. Salmonella happens in eggs laid by infected hens and unfortunately, a hen may not always present symptoms. Salmonella is known to thrive in caged housing. The type of housing heavily influences the occurrence of infection. Therefore home grown eggs are considered much safer to eat than their store bought counterparts. If you have too many eggs and feel like you’re not going to use them up, then you have the option to sell your excess eggs. Whether you sell them or gift them to friends and family is up to you. Freshly home grown eggs are always a well-appreciated gift that your loved ones are sure to eat up. It might even persuade them to get some chickens of their own. Raising your eggs in your garden cuts the cost of having to buy eggs from the shop. There are, however, costs that come with raising animals such as shelter, food and water. But, the benefit of walking straight into your back garden to collect some freshly laid eggs makes it all worth it. If you’d like to start raising chickens or raising animals to produce eggs, there are a few things you’ll need to get you started. As well as tasty and fresh eggs to eat, the shells, along with the manure can be tossed right into the compost pile. The birds spend most of the day entertaining themselves, picking at worms and making yummy eggs. It may sound like an obvious one but you need a chicken coop. It needs to hold water containers, a feeder and a nest box for every three to four hens. As well as having sufficient nesting boxes, think about where they will go. Most hens prefer to lay eggs in a darker, out of the way space. It should also be large enough so that you can stand up in it to gather eggs or shovel manure. The height should allow for roosting perches, where your chickens will sleep. Your coop should be protected from predators such as foxes. This is one of the main advantages of keeping chickens in a proper chicken coop and enclosure rather than letting them roam completely free all the time. Your chickens need to be protected from not only the side but above too as hawks and cats could also target them. In terms of interior space, allow a minimum of half a square metre per chicken, giving them plenty of room to roost and nest. You will also need plenty of space in your chicken run for your chickens to exercise and roam. This heavy duty galvanised steel chicken run wrapped with hexagonal wire mesh would make for a perfect chicken run. The pitched roof means you can stand up easily inside, while your animals are protected. Available in three different sizes the enclosure is well-suited for a number of animals including geese, chickens, ducks, rabbits, pigs and sheep. Just like any other animal, different chicken breeds have different qualities. Some chickens are more anxious with others being more cuddly and known as great egg layers. Some breeds thrive in the hot or cold weather while others lay eggs in crazy colours. You’ll need to decide on what qualities are important to you when choosing your chicken breed. Known for laying huge amounts of eggs is the Golden Comet, a hybrid breed. There are a number of hybrid breeds but the Golden Comet is one of the most common. Expect around 280 eggs per year, they will be medium-sized and brown in colour. Another option is the Plymouth Rock (Barred Rock), perfect for first-time chicken keepers. They lay roughly once every two days, around 200 eggs a year. The eggs will be small to medium sized and light brown in colour. You’ll need to decide what you want to feed your chickens. Having them roam free is nice, in theory, but as they are prey animals, it can be difficult to keep them safe from predators. Free-ranging produces healthy eggs, happy chickens, and a reduced food bill but could be putting the chickens in harm’s way. Having a large run or enclosure for your chickens to roam around in while being protected is the best of both worlds. 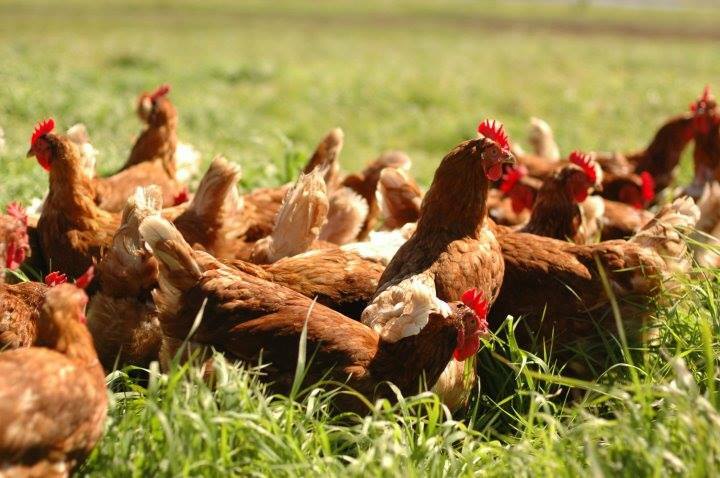 Whether you choose to free range your chickens or keep them closer to home, you’ll need to provide a high-quality poultry feed. They get a lot of nutrients from bugs and plants from the ground as well. These are just a few tips to get you started. Many people love the convenience of home grown eggs and once you start to taste fresh eggs every morning, it’s difficult to imagine your eggs any other way. Create an efficient and safe chicken run for your birds that they are sure to love, encouraging them to lay the best eggs. This entry was posted in Inspiration and tagged animal run, free range chicken. chicken coop. When in Home specialise in bringing you quality home furniture & garden products. The home of BULHAWK® & When In Home® products. We are also an official Baumhaus supplier.